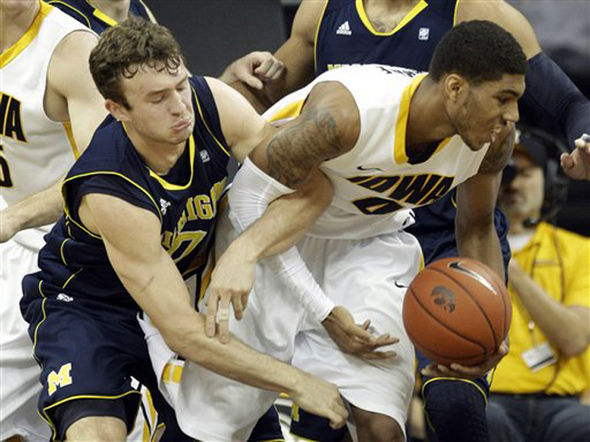 Posted on Sat, Jan 14, 2012 : 6:11 p.m.
Zack Novak and Michigan tangled with Roy Devyn and Iowa on Saturday and lost, 75-59. IOWA CITY, Iowa -- The road continues to be a cold, lonely place for the Michigan basketball team. The 13th-ranked Wolverines shot 38.5 percent from the floor as a team, turning in one of their worst offensive performance of the season in a 75-59 loss at Iowa. Michigan (14-4, 4-2 Big Ten) is 0-3 in true road games this season. "We weren't sticking to our principles," Michigan senior captain Zack Novak said. "They did what they needed to do to win. "They were just better than us." It marked the third consecutive game the Wolverines have shot worse than 40 percent as a team, and on Saturday, no one was sheltered from the struggles. The Wolverines entered Saturday in search of their first road win, and after a skittish offensive performance in Iowa City, Michigan's still looking. As a team, the 13th-ranked Wolverines shot 38.5 percent from the floor, 25.8 percent from the 3-point line (8-for-31) and 11-for-17 from the free throw line. Tim Hardaway Jr. and Evan Smotrycz combined to shoot 2-for-19, and Jordan Morgan attempted just one field goal in Michigan's most lopsided loss of the season. For the first time in his career, Michigan freshman point guard Trey Burke was saddled with early foul trouble. The Wolverines paid the price. Burke picked up his second foul 6:44 into the game, and Michigan coach John Beilein elected to sit him for the final 13:16 of the first half. Without their point guard, the Wolverines struggled. Michigan was 8-for-23 from the field with eight turnovers in the game's first 20 minutes. Michigan is 0-3 on the road this season. In those three losses, Hardaway has struggled. Hardaway is 11-for-41 from the floor and 1-for-18 from 3-point range in the Wolverines' three road setbacks (at Virginia, at Indiana, at Iowa). "We had too many mental errors (tonight). There's not really a lot to take from this game." Leading scorer Tim Hardaway Jr. finished 2-for-13 from the floor with nine points, Evan Smotrycz was 0-for-6 without a point and Jordan Morgan attempted just one field goal. As a team, Michigan went 8-for-31 (25.8 percent) from behind the 3-point line and just 11-for-17 from the foul line. "We took wide open shots, took some guarded shots, they just weren't falling," Hardaway said. "We can't control that, but what we can control is what's going on with the defensive end." Freshman point guard Trey Burke, who sat out more than 13 first-half minutes with foul trouble, led the Wolverines with 19 points — 16 of them coming after halftime. Novak finished with 14 points and nine rebounds. Iowa (11-8, 3-3 Big Ten), which dropped its previous two games by a combined 63 points, got a team-high 19 points from Matt Gatens. Southfield native Devyn Marble finished with 13 points, six rebounds and four assists. Michigan found itself in a mess early after Burke picked up his second foul, a charging call, sending him to the bench for the final 13:16 of the first half. Without their point guard, the Wolverines found little to no flow offensively, shooting just 8-for-23 and committing eight turnovers in the first 20 minutes. Iowa began to seize control after Marble capped an 8-1 run with a three-point play underneath to make it 28-18 Hawkeyes with 3:40 to play in the half. Michigan got back within five two minutes later after a pair of Jordan Morgan foul shots. But Iowa closed strong, getting a three-point play from Gatens and a buzzer-beating fallaway jumper from Marble to take a 10-point lead into the break. Afterward, Michigan coach John Beilein said he planned on leaving Burke on the bench for the remainder of the half -- unless the lead ballooned to double digits, something that didn't happen until the final horn. "He got his second foul and I think we still could have gotten out of that better, we took a couple hope threes and took a couple hope passes," Beilein said. "The eight turnovers we had in the first half, they weren't because we didn't have our point guard. "We missed him, but we didn't do what we needed to on the road." After Iowa's lead swelled to 14 early in the second, the Wolverines appeared poised to make a charge, as a pair of Hardaway foul shots at the 12:42 mark capped an 8-1 run to make it a 43-37 game. The Hawkeyes immediately punched back, though, smacking Michigan with a 10-0 answer that was polished off by an Aaron White layup to make it a 16-point game with 8:32 to go. The Wolverines never got back within single digits. "We had too many mental errors (tonight)," said Burke, who played less than 30 minutes for the first time since Michigan's season-opener. "There's not really a lot to take from this game." Iowa out-rebounded Michigan 39-30 and out-scored the Wolverines 32-22 in the paint. The Wolverines, who were playing their third game in a seven-day stretch, will get no breaks moving forward. Michigan hosts Michigan State on Tuesday (7 p.m., ESPN). From there, the Wolverines will play three straight road games (at Arkansas, at Purdue, at Ohio State) before returning home to face Indiana on Feb. 1. The Wolverines will enter their toughest stretch to date on the heels of their worse loss yet. "This is when everybody needs together," Hardaway said. "And just play their roles." Sat, Jan 14, 2012 : 10:53 p.m. It's okay, guys. Today was an odd day in college basketball. A lot of good teams got beat by inferior teams. At least we didn't lose by 33 to Florida State. Stop being so reactionary. This team is gonna be fine. They'll probably lose 4 or 5 more conference games -- hopefully less -- but we'll make it into the tournament no problem. This team has exceeded my expectations this year. I really thought they were gonna be lousy, but they've been tough in all their games except at Virginia and at Iowa. Get over it. It happens. Next game, please. Sat, Jan 14, 2012 : 10:29 p.m. Very frustrating game to watch...all these &quot;shooters&quot; recruited specifically to score not getting it done. when the 3s aren't falling, guys like Hardaway and Burke need to drive the lane. The inside game with Morgan is non-existent...he was an effective scorer last season around the basket. This is a wake-up call to be sure. Sun, Jan 15, 2012 : 2:58 p.m. I so agree with you! I kept yelling, &quot;Drive the lane, drive the lane!&quot; and they just kept shooting 3's. I was so frustrated. Beilein has got to get out of this notion that shooting 3's will always win the game! Sat, Jan 14, 2012 : 10:22 p.m. It looks like this team is running at 3/4 speed. Morgan has been a complete no show this season. He is standing around and when he gets a pass his hands are suspect and either gets covered before he can make a shot or loses it out of bounds. Hardaway is falling in love with the 3 and his percentage has been dropping. He need to drive to the bucket much more and earn his points. Burke is the bright spot on this team besides Novak who is always scrapping for rebounds and showing heart, but if his shot is not falling we are in trouble. 2 out of 5 players hussling is not going to get it. From what I read there will be at least 2 new front line starters coming in next year and some people we were counting on to be starters this year will be role players off the bench next year. Unless Beilein can get these guys to hussle and board as well as have many more shots fall we will be lucky to even make the tournament by year end. Our front line is way too soft to be rated as high as we are currently. Next year's freshman can't get here soon enough. Sat, Jan 14, 2012 : 9:44 p.m.
All the die-hard UM supporters may as well face reality. Any student of the game could see it coming in the last game against NW. This team is not ready for prime time-too inconsistent and usually plays better at home than on the road. I had high hopes this year, but I suppose I should be acccustomed to the failure of the Beilein system. Obviously, the team must play A+ basketball to beat MSU. Back to the drawing board, as mediocrity won't get er done guys. Sun, Jan 15, 2012 : 5:07 a.m.
hopefully its the MSU that lost to NW today and not the one that beat Iowa by 40. It being at Crisler, UM should prevail. Sun, Jan 15, 2012 : 3:08 a.m.
You mean the MSU team that lost to Northwestern today? Take a deep breath. I know they played poorly today, it happens. Road wins in the B1G are hard to come by. Let's not jump ship so fast. Sat, Jan 14, 2012 : 9:30 p.m.
We are underachieving big time. There is not a player on this team playing to his potential, with the exception of Burke. They seem totally lost on offense. If this keeps up, we will be on quite the losing streak by the time Indiana comes calling! Sat, Jan 14, 2012 : 9:15 p.m.
That's what happens, when you get caught looking ahead. Sat, Jan 14, 2012 : 8:35 p.m. I like Beilein's demeanor and think he fits in well with the other Michigan coaches. The constant problem he has had, though, since he has been our coach has been that if our 3's aren't falling, we lose. He seems to not be able to get any of his teams to go inside, to set up 10-14 foot jumpers, and to rebound hard. Defenses can relax and know that we will lose since we can't punch the ball inside. It hurts that our best player (Hardaway) shot poorly, but if we are so dependent on one or two players (TH, TB), then we are not going to be successful. And that is one downside of Beilein's career at Michigan. Sat, Jan 14, 2012 : 8:29 p.m.
Michigan needs to find an antidote for this terrible shooting. Shooting in the 30's %-wise is not going to cut it if this team wants to contend for the Big Ten title or get an NCAA bid. Hardaway and Smotrycz are in full-blown slumps right now. Burke can't do it all himself. Speaking of whom, I believe it was a mistake for Beilein to keep him on the bench in the first half for so long after Burke got his 2nd foul. Without his offense, the Iowa lead built up to double digits by halftime. It's too bad because Iowa on the road was a win-able game for Michigan. But even home games are going to be tough to win with shooting like this.